Weighted vs. Unweighted Categories Currently, Infinite Campus has us create Assignments within Categories. Each category can be given a certain weight. Within our Standards-Based Learning, this is either 1 (all assignments are counted equally into the overall academic grade) or 0 (none of the assignments are counted in the overall academic grade). Other than drilling down into the Categories view or doing some quick mental math in the Gradebook view, there is no visual way to see the weight of a category. Included vs. Excluded Categories You can see in the above screenshots the options to exclude categories. This provides a much better visual representation of an Assignment not being calculated in the overall academic grade, but accomplishes the same thing mathematically as a weight of 0. In the Gradebook view, an Excluded Category shows up in red. Active vs. Inactive Assignments You can see the two different pieces of red text in the above screenshot. The red category indicates that it is excluded. The red Assignment "A1D" indicates that it is inactive. This accomplishes the same thing as an excluded category, but on the individual assignment level. Assignment Marks This feature of Infinite Campus allows us to use a 1-4 rating scale that is weighted or curved. 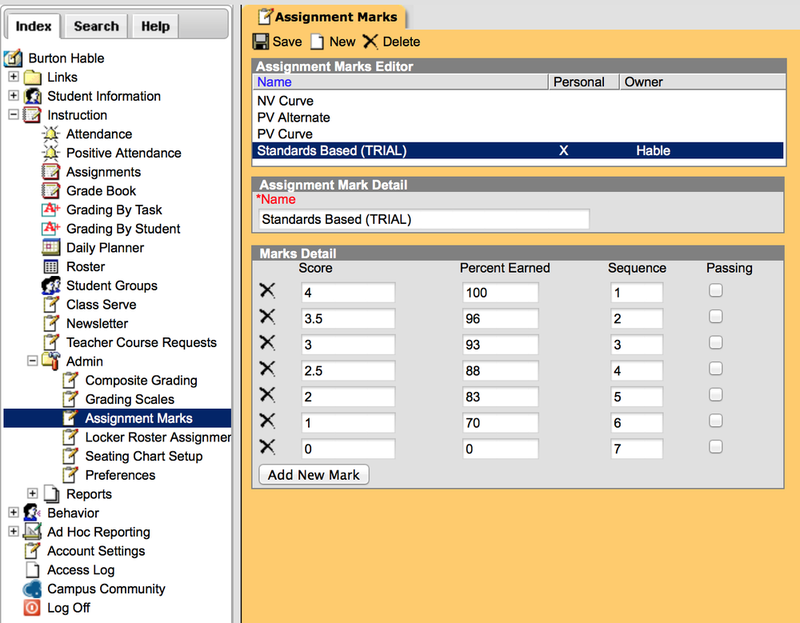 In the Infinite Campus Directory, under Instruction -> Admin -> Assignment Marks, you can create a new grading curve. Make sure that all of your assignments meant to be assessed using Assignment Marks are selected as such! If you set them up as 4 points, then a ¾ will calculate as a 75% instead of the weighted 93%. We found this out the hard way during our first time posting grades. Google Docs to "Average" All of our assessments are currently done using SmartMusic (which I will detail in a later post). 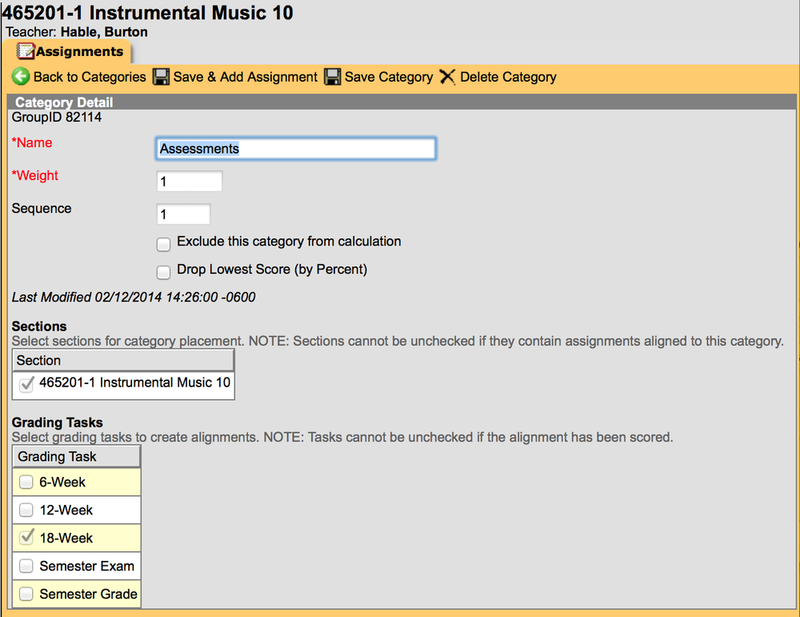 We find the SmartMusic Gradebook a bit cumbersome. We utilize its ability to record and playback student assessments to listen to their assessments and record their grades via Google Docs. We set up a Google Sheet with students names along the left-hand column, and each following column corresponding to a standard from the Wind and Percussion Rubrics. We then sum the points from all of the columns and use a similar weighting to the Assignment Marks to convert the grades for Infinite Campus. Looking into the Future As we continue to experiment with Standards-Based Learning and making it work in our teaching environment, we are constantly adjusting. We have found things that we are both happy and unhappy with in terms of SmartMusic, Google Docs, and Infinite Campus. That being said, I feel very good that we are heading down the right path towards defining what we want our students to be able to know and do at each grade level and accurately assessing those skills. I plan on experimenting a bit more with SmartMusic, and I will detail that in a later post. I also plan on experimenting more with JumpRope, a gradebook designed with Standards-Based Learning in mind. I plan on writing a bit more about that as well. I think the most important part is the experimentation! We have found new and better ways to teach and assess material and our kids are better for it. It makes my teaching fun and exciting and constantly evolving. Is it next year yet?